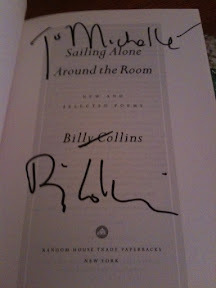 TSS – Billy Collins & Poetry – my books. my life. Yesterday, Ben and I made the 2-hour drive (where’s that high speed rail?) 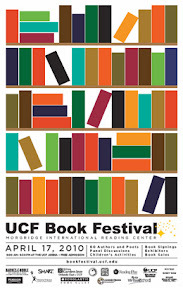 to Orlando to attend the very first University of Central Florida Book Festival. 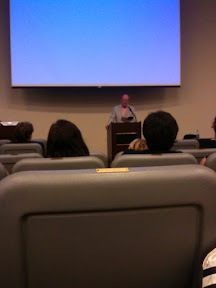 Authors, publishers, and readers spent the day listening to lectures and readings, meeting writers, and buying books. This festival caught my eye pretty early, and if it had been in Tampa, I would have no hesitation about going. But it was in Orlando, so something bigger than that had to convince us to attend. That thing was Billy Collins. I am not a poetry reader. I believe I recently shared the root of this problem with you: too much John Donne in AP English 10 years ago. 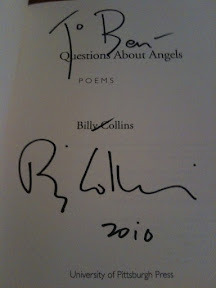 However, Ben does enjoy poetry (English teachers and their poetry *shakes head*) and his favorite poet is Billy Collins. And I just really wanted to meet someone who had been the U.S. Poet Laureate (can I be the laureate of something?) So we went to the festival primarily for him. He was a delight. Funny, quick, and all-over entertaining. He read us some of his poems and I found myself thoroughly enjoying them. His poems are about everything and anything, from a lost chess piece, to a spring day, to Virginia Woolf and her inflatable canoe. Perhaps poems are better spoken than read (and at least I don’t have to analyze these ones in a timed writing). After he was done speaking, he signed our books. He was friendly and seemed to enjoy speaking with his fans. He joked about how Ben actually knew how to find a title page, and asked where I went to school and worked. I don’t get to author signings like those of you in the more literary cities do, so I don’t have much to compare him to, but I can’t imagine all writers are like that. If they are, I must start going to more of these things and perhaps move to one of those literary cities. I thought this experience was fitting for National Poetry Month and I may just give poetry another chance now. Ten years should be a long enough recovery time, right? What an awesome event! Billy Collins is my favorite poet as well. I went to a live taping of Prairie Home Companion and he was a guest on the show, he helped with the radio skits and also read a few poems. I’d love to see him sometime at his own event. I’m reading his collection, “Picnic Lightning” right now in honor of National Poetry month. If you’d like to get more into poetry in general, I recommend Garrison Keillor’s collection “Good Poems.” It’s a very nice anthology, Garrison does a great job of selecting poems that are very approachable, not unlike Billy Collins’s are. You almost make me believe… I liked SOME poetry when I was forced to read it in class, but I rarely find myself motivated to read it. Sounds interesting! I have never been to an author signing / reading and am so jealous when I hear of other people’s experiences 🙂 Some day though, some day! Pingback: A Special Welcome to New Visitors - my books. my life.